Hawthorn is a ‘middle-ring’ residential suburb 6 km east of Melbourne. Its topography rises immediately east of the Yarra River valley, and it has the Gardiners Creek on its south. The suburb’s northern boundary is Barkers Road and its eastern boundary is Auburn Road. The municipality of Hawthorn (1860-1994) was bounded by the two river valleys, Burke Road on its east and Barkers Road on its north. The Hawthorn township reserve was surveyed in 1837. It was immediately east of the Yarra River where Church Street meets Burwood Road. Farm size allotments were also surveyed in Hawthorn in 1843 and sold during that decade. The township site is readily recognised by the Gothic Revival Christ Church (1853) and the Hawthorn West primary school (1853) north of Burwood Road. On the south side of Burwood Road, on a knoll overlooking a bend in the Yarra River, is ‘Invergowrie’ (1852), a homestead situated on land which was later subdivided by the theatrical entrepreneur, George Coppin, in 1871. It contains several houses on the register of the National Estate and is a Conservation Area. Invergowrie was set in Burwood Park, the name given to Burwood Road which became the district's main road out of Melbourne which had bridged the Yarra River (1851). Less clear is how Hawthorn was given its name. Early spellings had an ‘e’ on the end, but that was dispensed with in the gazettal of the municipal district in 1860. Hawthorn/e may have been named after a visitor who called on Hoddle, or settled on during a conversation between the owner of Burwood Park, James Palmer, and Governor La Trobe, who thought that the native shrubs looked like flowering Hawthorn bushes. There was also a bluestone house ‘The Hawthorns’ built in Creswick Street in 1843. Hotels were opened along Burwood Road: the Hawthorne at Barton Street (1852), the Governor Hotham at William Street (1855) and the Tower at Camberwell Road (1876). After the railway was extended from Burnley to Hawthorn (1861) the Railway Hotel was opened nearby in 1869. 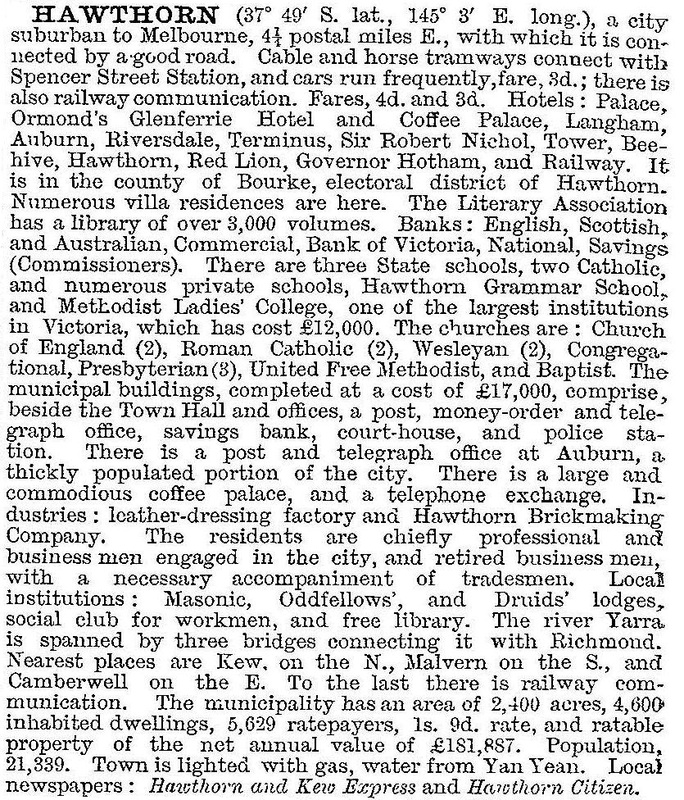 In 1854 Hawthorn along with Kew and Camberwell, became the Boroondara Road District, and in 1860 Hawthorn became a separate municipality. By 1865 Hawthorn's population was about 3000 persons. Its first town hall had been built and its landscape was populated with market gardens, residences of ‘persons engaged in Melbourne in business’ and several brick fields. The first Presbyterian church in the Hawthorn area was built in Glenferrie Road in 1864, and several Hawthorn Presbyterian congregations resisted union with the Methodist church one hundred years later. The Hawthorn municipality has many large well built churches, particularly in Glenferrie and Auburn where to this day they are the dominant shapes on the skyline. In terms of the municipality's growth it was around Upper Hawthorn, now Glenferrie, where houses and shopping were attracted in the 1870s and 1880s. The railway was extended to these areas in 1882 and a horse tram service in 1890. In 1916 the Hawthorn Tramways Trust opened the electric tramline along Burwood Road, Power Street and Riversdale Road, replacing the horse tram. The Trust's depot was at the corner where Power Street meets Riversdale Road, where the line was met by another Trust line from Princes Bridge from Melbourne, via Swan Street, Richmond. Hawthorn thus gained a second city to suburbs route, parallel to the railway line. Burwood Road became a mixed retail and manufacturing thoroughfare. Factories included carriage builders, wood turning and furniture, clothing and, most famous of all, Fowlers home bottling factory and warehouse. The absence of a tramline would have discouraged shops rather than factories. Slightly east of the Hawthorn railway station Grace Park was laid out in 1897. Ten years earlier a spur railway line was opened to Kew, running along the east side of Grace Park. It closed in 1957. On the other side of the line the Glenferrie oval became the home of the Hawthorn Football Club. The Club, founded in 1873, was in the Victorian Football Association until it joined the League in 1925. (It transferred to the Princes Park oval, Carlton, as its home ground in 1974 and then in 2006 to a combination of Waverley Park, the MCG and York Park in Launceston. After a 17 year hiatus, Hawthorn won premierships in 2008, 2013, and 2014.) Adjoining the oval is the Hawthorn baths. Tennis has been well provided for at the Grace Park Courts, producing champions such as Frank Sedgman, Mervyn Rose and Margaret Smith (later Court). The Council was able to provide parks on several filled clay pits during the years before World War II, although some pits were worked well into the postwar years. Despite the reference in the Australian blue book to residences of a very superior class, the housing stock in Hawthorn west and central was old and contained many cottages in a rundown condition. The larger houses were suitable for conversion to rental flats. The demolition of old residences for new flats became a local issue by the 1970s. By 1981 over 45% of Hawthorn's housing stock was flats, compared with 26% in Kew. In contrast to many inner urban cities Hawthorn's postwar population decline was nearly arrested by the flats, falling by only a few thousand between 1947 and 1971. The loss of some prominent houses was obvious, such as at the corner of Glenferrie and Riversdale Roads where a service station was built, only to be replaced with a Chinese restaurant (1973) which failed and was replaced by an ice-cream outlet replete with pagoda decor. By way of contrast on an opposite corner was Melbourne's longest running private lending library, run by two elderly ladies. Despite the rapid growth of flats in Hawthorn there was a contrary trend toward the preservation of many of the surviving larger homes. Internal subdividing walls were removed and flats were converted back into homes. Other large buildings were converted into more sensitively designed apartments. The boom in period real estate peaked in the late 1980s. An active preservation area was around St James Park, adjoining Hawthorn's original town site. Preservation extended to a quite costly refurbishment of the Hawthorn railway station buildings, some of which had been transferred many years before from the first Flinders Street station in central Melbourne. St James Park is one of several open spaces in Hawthorn, most of which are linear ones along the edge of the Yarra River and Gardiners Creek. 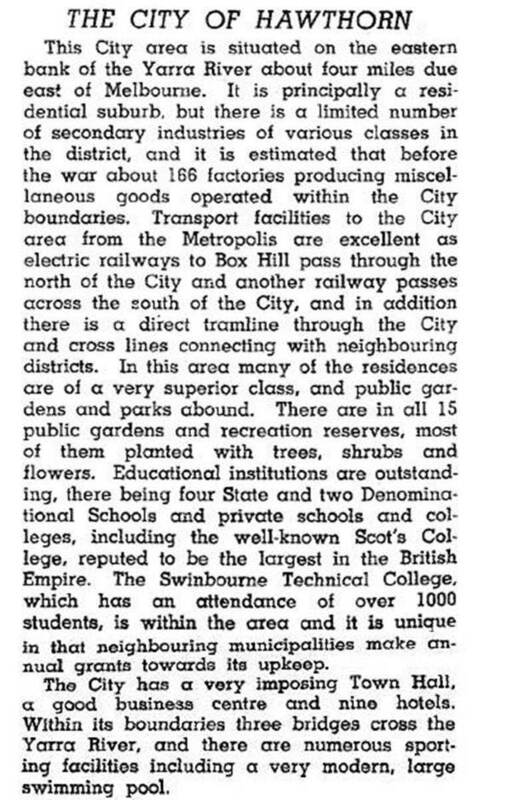 One 22 June 1994, Hawthorn city was united with Camberwell and Kew cities to form Boroondara city.